It is time! The grand opening of Toy Story Land will be broadcast during a live-stream broadcast on the Disney Parks Blog on Friday, June 29 at 10:55 a.m. 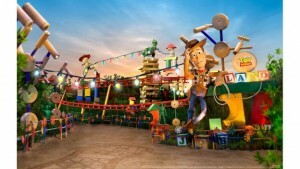 The live broadcast will feature Buzz, Woody, and Jessie as they open the brand new land at Disney’s Hollywood Studios. Toy Story Land is home to two new attractions – Slinky Dog Dash and Alien Swirling Saucers, in addition to a new quick service location, Woody’s Lunch Box. Toy Story Mania is also part of the land. Characters from the Toy Story films will also be in the land to meet guests. The live broadcast starts at 10:55 a.m. on Friday, June 29, at the Disney Parks Blog.